Win a CEW swag bag worth over $600! President Carlotta Jacobson is clearly excited when she talks about the 2011 CEW entries. “We’ve seen an explosion in the nails category,” she says. Based on impressive sales over the past year, the organization created a specific category for nails which includes submissions from the cream of the crop entries including Essie’s “No Chips Ahead” Chip-free Top Coat to Nails Inc. London’s Magnetic nail polish (a personal obsession). Cosmetic Executive Women allows people from all walks of the industry to vote on their favorite product submissions, across varied and exciting categories from Bath & Body (the largest) to Fragrance. Each product category (with a few exceptions) is divided into “Prestige” and “Masstige” so luxury brands and drugstore brands aren’t stepping on each other’s toes. Anti-aging was always big (you’ve got to have that radiant, youthful glow after all –right?) and products like Estee Lauder’s Idealist Even Skintone Illuminator and Dr. Dennis Gross Skincare™ Active Vitamin D Serum-Oil are some of the innovative entrants this year. Jacobson says we’re seeing many more multitasking products, especially in the foundation category. “They’re not calling it anti-aging per se,” she says, “but you see a foundation that has anti-aging benefits,” for example. Some of the entrants in the “Face Product Prestige” category do have these anti-aging qualities to them, like josie maran cosmetics‘ Argan Matchmaker Serum Foundation and Giorgio Armani Beauty‘s Designer Lift Smoothing Firming Foundation. Jacobson says she’s not seen too much of an explosion in the fragrance category, but the Prestige Fragrance business really has done exceptionally well. Hey, a gal’s gotta smell gorgeous! We’re giving you the chance to win some of the best and brightest products entered across various categories at the CEW 2011-2012 Awards. If you’re a member, don’t forget to vote (you have until March 21, 2012) to brainstorm and cast your thoughts! 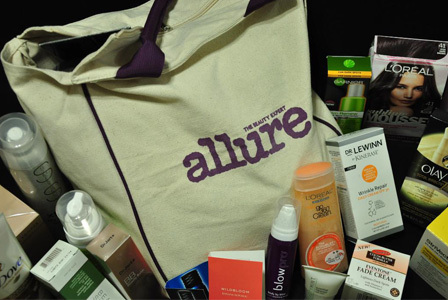 One lucky winner will win a pretty impressive swag bag filled with products from various brands across multiple categories. We’re estimating the value of the bag at well over $600 and these include various items from that luxurious eye balm you’ve been coveting (e.g. Algenist Skincare Complete Eye Renewal Balm) to cool must have makeup like Make Up For Ever’s Aqua Liner. Simply check out our giveaway page for more details!